The Professional Food Sensitivity Pack provides you with all the information you really need to manage the whole diet investigation process. Now you can get the information you really need to manage the whole diet investigation process, from first contact to confidently having the patient manage their own or a member of their families diet and getting results. There are many fascinating areas of dietetics explored. The pack provides a deep insight into this challenging and newly developing area that many professional training schools are not yet able to offer in their training. There is still much controversy with regard to the theory. but the practice has been developing over the last thirty years and it now well established. The best selling food sensitivity book Are You Food Sensitive? The thesis (the “evidence base” for much of the work) is included. The Practice Manual explains detailed diet therapy incorporating food chemical sensitivity as well as allergy. It is designed to give professionals confidence in each step of the process. 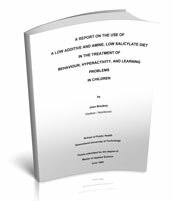 Joan Breakey has spent years developing this approach from clinical research directly from foods that patients tolerate and have adverse reactions to. Joan Breakey is one of the few dietitians in the world who has a lifetime of specialisation in the area of Food Sensitivity. She has been a practicing Dietitian, Home Economist and Teacher for forty years. In 1975 she began her first work on Diet and Hyperactivity, investigating the effects of the Feingold diet on children’s behaviour. For the last thirty years Joan has been publishing and presenting the results of her on-going research in this area. She has worked as the Adviser in Nutrition and Dietetics to the Department of Health in Queensland (Australia) and as a Dietitian in Community Child Mental Health in the Division of Youth, Welfare and Guidance. In 1983 Joan continued her research, conducting clinical research with families using dietary treatment for behaviour, learning and activity problems. In 1991 she published the results of a follow-up study of over five hundred families. As well she has worked with hundreds of families in private practice investigating the role of diet not just in behaviour, but also in treatment of physical, allergic and food intolerance symptoms such as eczema, asthma, hay-fever, migraine and abdominal pains. Food sensitive people are often those who are very sensitive to smells, strong tastes, bright lights, particular noises, and textured clothes. Through her work with hundreds of food sensitive people Joan can give a picture of how sensitive they are. See how using the Diet Detective Investigation method you can see how diet can help. 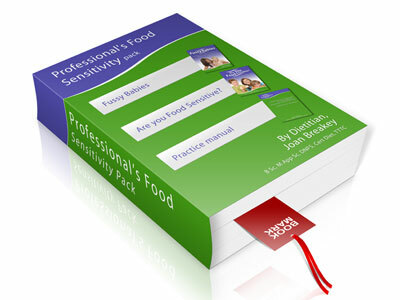 Purchase your copy of Professional’s Food Sensitivity Pack eBook and get access immediately. So “what’s an e-book ?”, you may be asking. Ebooks are the popular new way of publishing, purchasing and reading books. An eBook is simply a digital version of the traditional paper based book. E-books can be read on your PC or laptop. As well as saving some trees (of course you can still print the e-book) being digital, you can download Fussy Baby without the delay of postage and delivery costs. Download Professional’s Food Sensitivity Pack in minutes, purchasing through our secure online payment process, using Visa, Mastercard or Pay Pal. 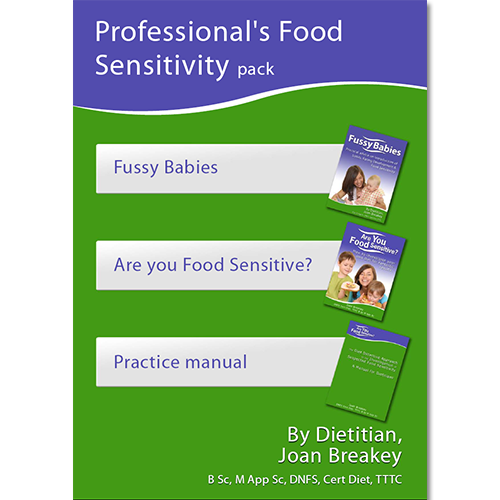 Get all 3 books, the Practice Manual, Fussy Babies and “Are You Food Sensitive?” plus the Thesis (valued at $5) for only $50.The Professional’s Food Sensitivity Pack is recommended to give you a complete understanding of the process for the patient in greater detail. Get the hard copies of all 4 books, the Practice Manual, Fussy Babies and “Are You Food Sensitive?” plus the Thesis (valued at $5) for only $68. The Professional FoodProfessional Food Sensitivity Pack Sensitivity Pack is recommended to give you a complete understanding of the process for the patient in greater detail. Thesis only: $5. Included FREE with the Professional’s Food Sensitivity Pack. Are You Food Sensitive? You can print the e-book however we ask that you treat the material as you would a printed book, lending it family and friends but not reproducing it for wider distribution. The licence allows the e-book to work on 1 computer at a time. You can easily transfer the licence to another computer whenever you wish.